The Annular Solar Eclipse in Virgo on 1 September 2016 has ties with the Total Pisces Solar Eclipse that happened earlier in the year on March 8, but is most deeply bound to release into the Pisces Lunar Eclipse which will arrive on September 16. Whereas the Pisces Solar Eclipse was an initiation into the dramatic changes of the year, the Virgo Solar Eclipse mediates events of the past six months at the same time it launches us into a new cycle of growth that will intensely flow into the Lunar Eclipse in Pisces that follows. The ruler of the eclipse is Mercury at home and in exaltation in Virgo, but this is not your typically swift Mercury. The Mercury ruling the Solar Eclipse is barely moving, having stationed retrograde two days prior. Motionless in contemplation and analysis, Mercury retrograde is closely receiving Jupiter in a conjunction while also conjoining Venus in Libra, fortunate aspects that counterbalance the Solar Eclipse being opposite Neptune and closely square to the conjunction of Mars and Saturn. Though the path may be labyrinthine in twists and turns, the Virgo Solar Eclipse will bring about discernment into grounded steps to take forward into the coming season, while letting go of old dreams we now realize were more illusory than practical. With the Solar Eclipse conjoining the North Node of the Moon in Virgo, and its ruler Mercury also in Virgo, there is clear intent to attune to the natural enfoldment of cycles in our life, accepting and shedding what is passing away while being open to what is beginning to take form. Liz Greene in The Astrology of Fate connected the winged goddess Astraea to the Winged Maiden of Virgo, a daughter of Zeus who walked the Earth during a Golden Age of prosperity in order to foster harmony amongst humanity with the natural world and its inherent order. Astraea like Virgo honors the creation and destruction of the natural order, the waning and waxing of the Moon, the cycles of seasons and their connection to growth and decay. There is Mercurial pleasure Virgo takes in following the order of natural cycles, displeasure when creating disorder from forcing things to happen that go against the appropriate timing of the moment. If we can let go of whatever attachments are getting in the way of opening to the naturally occurring change happening at the Virgo Solar Eclipse, with the willingness to trust the flow of life will come keen awareness of choices that will lead to essential development. Since the Solar Eclipse is Annular, it means the fertile void of its blackness will have a ring of light around it. Annular eclipses occur as a result of the Moon being far enough away in orbit from the Earth that its shadow does not completely cover the Sun. One of my favorite interpretations of solar eclipses is by Dane Rudhyar, who said the symbolism of the Moon’s shadow covering the face of the Sun suggests that forces from our past, as well as unconscious influences, veil the present with their fecund darkness. Eclipses can feel like an uncontrollable tidal force taking us into an unknown we do not always feel ready for. In combination with their unworldly visual element when seen, people have feared eclipses for ages, in ancient times portraying them as a great dragon of chaos and creation consuming our Sun and Moon. Yet eclipses do not need to be feared. Dragons are symbols of instinct and chaotic destruction that bring together the spiritually elevated with the chthonic, similar to eclipses in that greater wholeness can be found through the dissolution they bring about. When stepping into the streams of eclipse season its best to remember the old fragmentary wisdom of Heraclitus: unless you expect the unexpected, you will not find it, for it is hidden and pathless. The lunar nodes are wholly metaphysical, as they do not physically exist but are instead calculations originally discovered to predict eclipses. The lunar nodes are points in space found through the intersection of the Earth’s orbit around the Sun with the Moon’s orbit around Earth: the South Node of the Moon being the descending arc of the Moon’s orbit (associated with the tail of the dragon, the past, release, the unconscious), while the North Node of the Moon is the ascending arc of the Moon’s orbit across the ecliptic (associated with the head of the dragon) and therefore has become associated with the conscious ascension of desire for incarnation and manifestation in our material realm. Vitally, the Virgo Solar Eclipse is conjoining the North Node of the Moon. As a result, the eclipse will awaken intimations of future growth and activate new methods. The intersection of the past into the eclipse portal brings a Dragon’s Pearl that has been born from the darkness of the beast’s belly, a natural gem purified across time that now opens awareness to future potential and evolutionary growth. 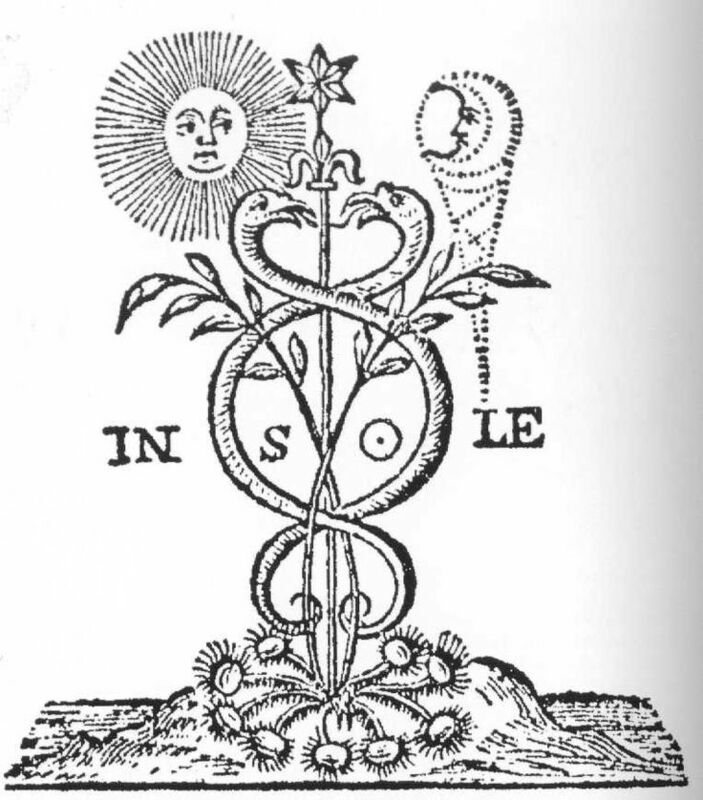 There are diverse interpretations of the lunar nodes in astrology, but one unifying concept is that meaning coming from the South Node of the Moon is released in a way that amplifies the meaning of the North Node of the Moon. What we can all agree on is that Neptune is conjoining the South Node of the Moon, and the Solar Eclipse is conjoining the North Node. This results in a release valve on Neptune feeding into the eclipse. Neptune here dissolves old illusions that have been limiting your perspective, washing away fantasies and dreams that are not congruent with the bare bones of your circumstances and achievable in practical, concrete steps. This does not mean to limit your thinking or keep yourself boxed into a restrictive place, only to fully accept your surrounding environment and what is actually happening, who or what are actually in reach as resources. Adding incredible intensity to the eclipse is the conjunction of Mars and Saturn in Sagittarius that forms a square to the lunar nodes. Positively, this alignment can point to what structures need to be torn down, rebuilt or further strengthened, as well as support creation of a blueprint for an entirely new structure that will bolster one’s essential meaning being developed. For those grieving a loss, within the hard feelings healing can come from retrieving irreplaceable elements of what has passed away that will continue to bring value going forward. As awareness focuses on the true change occurring that contrasts with what had been expected or hoped for, the Mercurial element of the Virgo Solar Eclipse can facilitate attuning to the underlying fabric of what is really going on. The Sabian symbol for the Solar Eclipse is “Two heads looking out and beyond the shadows,” which Dane Rudhyar described as unveiling “the growth of true understanding, born out of the transcendence of duality even while immersed in the world of duality.” Essentially, Rudhyar meant the tenth degree of Virgo points to our mind operating within the conflicts and oppositions of duality, with potential realization revealing that the opposite sides of duality “are complementary aspects of the one Reality which sustains and encompasses all dualistic modes of existence.” Rudhyar emphasized this broader awareness facilitates moving beyond the shadows generated by internal conflicts. This sounds a lot like the transcendent function of Carl Jung, in which holding the tension of oppositions within the psyche mediates between the ego and unconscious, leading to new awareness that unites the internal opposition creatively. An ancient fragment of Heraclitus comments on this idea of two opposite things coinciding within one thing utilizing the Sagittarius imagery of the bow and arrow: the name of the bow (βιός) is life (βιός), but it’s work is death (the word that means “life” and “bow” have the same letters but there is a stress on a different syllable when spoken). Another fragment of Heraclitus also draws upon this same concept of harmony underlying the asymmetrical through the imagery of the strings of a bow being pulled backwards in two directions at the same time: they do not understand that what differs agrees with itself; it is an attunement of opposite tension, like that of the bow and the lyre. Since Mars and Saturn in Sagittarius being in hard aspect to the opposition between the Virgo Solar Eclipse and Neptune in Pisces signifies conflict, if we want to avoid becoming lost in the whirlwind we need to loosen the dogmatic side of Sagittarius and fortify the shifting quality of Sagittarius that synthesizes and coalesces understanding out of change and strife. Relationship issues will receive care and attention as a result of Venus being at home in Libra at the eclipse, increasing in light as an Evening Star. As the Moon waxes toward its Lunar Eclipse on September 16, Venus will work on healing the fracturing of Mars and Saturn through forming a sextile to each, and then applying to an opposition with Uranus in Aries. The building opposition between Venus and Uranus in between the eclipses stokes the intensity and electricity of the eclipse season, with startling insights that jolt us out of previously restrictive relational patterns striking unexpectedly. Most importantly considering the waves of change occurring that will feel unsettling to many, Venus in Libra supports listening to the needs of others in relationship as well as not only listening to our own needs but expressing them to others in direct communication. A few days after the solar eclipse, after the waning moon in Virgo passes over Jupiter and enters Libra to conjunct Venus, Jupiter will descend at sunset from being an Evening Star into its invisible chthonic phase in which it will be purified and regenerated under the beams of the Sun. When Jupiter ingresses into Libra in the following week, it will enter its new sign only a couple of days before the last exact square between Saturn and Neptune. Jupiter during the upcoming eclipse cycle will illuminate an old vision of who we are in relationship so we can release and let go of how we have been holding ourselves back in our interactions with others. Additional support for embodying a new presence that may feel unfamiliar, yet allows us to ignore external judgment and express greater genuineness can be found in the conjunction between Juno and the mean node of Black Moon Lilith in Scorpio that forms a sextile with the Virgo Solar Eclipse. The Sun rules the first face of Virgo, giving the Sun enhanced ability to bring about its solar significations than it otherwise would by being in the home of Mercury. Mercury retrograde receiving its conjunction with Jupiter in Virgo highlights a visionary potential to be found in the smallest of tasks performed with integrity and absorbed focus. To embody our solar potential available at the Virgo Solar Eclipse, however, we need to turn this magical focus within in order to fully embrace and accept everything about ourselves. With the additional activation of Libra that comes through the eclipse, it is vital not to project inner issues into our relationships but instead listen clearly to what our relationships are communicating to us, not how we are interpreting their message in relation to our own issues. With full embrace of our current reality within its streams of change, the Virgo Solar Eclipse becomes a powerful stepping stone on the path of creating deeper sustenance and fulfillment out of the shifting tides coming through this September. BBC Radio 4, In Our Time. (7 December 2011). Heraclitus.